An Incident recently made my blood boil, and when my blood boils, I get to tell you what I think. Today I am going to tell you what I think about Blog Bullies. A blog bully is some who uses the comment section of a blog to tear into someone, put them down, attack their homes and family. Just like any bully, they get their joy making others feel bad. On the site Apartment Therapy, Dana Tucker did a home tour. People, this lady opened up her home for you to look at. She cleaned, staged, photographed, and took the time to respond to questions. She did not deserve what she got from a select few. Here are a few pictures of the comments. I have seen this before. Bullies. They smell blood in the water. It only takes one to bring out all the others. It used to be the playground, now it is the internet. Mean girls. Ever have to deal with them yourself? I have. I don’t blog for a living. I don’t know Dana Tucker, I have no affiliation with Apartment Therapy, I am not a designer who decorates homes for a living. I blog because I like sharing what my husband and I do to our home, our experimentation with furniture, and our roadside finds. I also don’t publish the comments of bullies on my site. If you write a comment on my blog, I have it set so that I can filter out hurtful words. And I don’t apologize for not publishing mean words. One comment or told me once that nothing I do is any good and I should give up. Guess what? I didn’t publish the comment. 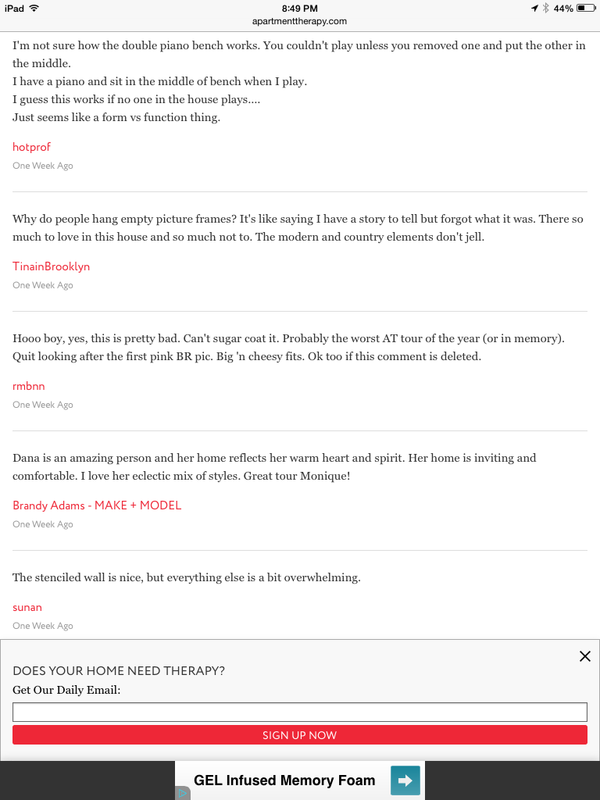 According to what I read, the most offensive comments about Dana and her house were removed but there were definitely some comments left that crossed the line in my mind. 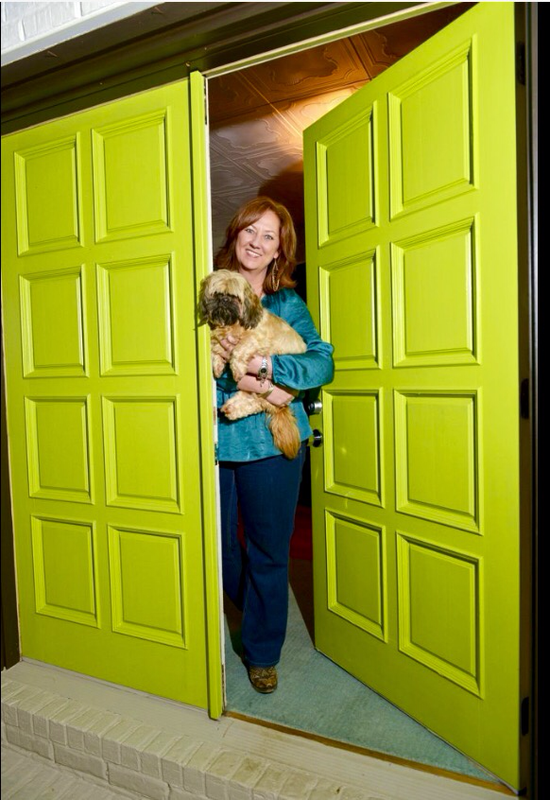 One responder called the color of the door putrid. Did that comment need to be made? I welcome hearing from you. I welcome suggestions. I am even okay with being told that what I do wouldn’t work in your home. Variety is the spice of life. One example is that I am not crazy about super modern furnishings but I appreciate that they are beautiful in the right home. As blog readers I am going ask you to speak up when you see bullies posting . Thank you for taking the time to read what I write. It means more to me than you will ever know. I agree. And, I’ve quoted Thumper to my own children and my school “kids” as well. Not sure why people enjoy being hurtful jerks. I don’t understand mean people either. Thank you for bringing this up. It is one of my biggest peeves. My mother told me years ago “If you don’t have anything nice to say, don’t say anything at all.”. Obviously not everyone received the same message…or they chose to ignore it. I used to respond back to these people, but sometimes I feel they do it for the attention. They feed off the responses, and enjoy the argument. Don’t get me wrong, I know my share of people who don’t even seem to realize how rude they are, but after watching some of these arguements in the comments, I feel like by telling them how innapropriate they are, I am fueling the fire. My rule of thumb (usually…sometimes I can’t help myself) is to give them one comment letting them know how very unthoughtful they are. If they keep arguing, I leave the argument. By continually arrguing, they are the ones looking for a fight. I refuse to aid a bully in bully behavior. What a great response. I totally agree with you. Oops! Sorry. I see you had the same quote as me. Well, Thumper did. :-). I couldn’t get the video to play. It worked right after my first post. (I haven’t seen Bambi for years. I forgot he was famous for this saying.). My mom said it, too. We loved Bambi. I hardly ever post comments to the crafty DIY sites BUT this one I just had to. I just wanted to say YOU GO GIRL, but my RANT got a hold of me. My rant got a hold of me, too. Thanks for writing.